WyoDaily Web Design provides professional, affordable, quality web site design and maintenance for all types of web sites. 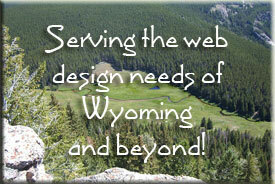 WyoDaily Web Design specializes in custom designed web site to fit each individual client's needs, at affordable prices. From personal web sites to e-commerce business solutions, WyoDaily Web Design can create a site to suit your needs. A way for potential clients to contact you? An avenue for displaying products and services? Transacting sales directly through a web site? Then let us create a web site that works for you! WyoDaily Web Design can also help you create custom logos and graphics for your web site, register domain names and set up server space to host your site. Contact us for more information or a price quote for your new site! WyoDaily Web Design works in conjunction with First Type Graphics, a web design company proudly serving it's customers since 1991. Visit our Portfolio of web sites we have designed.